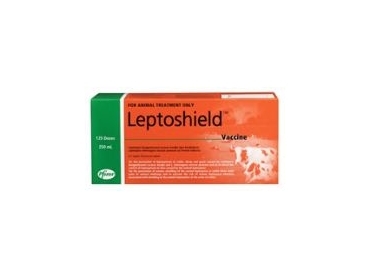 Leptoshield is used for the prevention of Leptospirosis in cattle, sheep and goats and as an aid in the control of Leptospirosis in deer. Global studies have indicated that Pfizer Animal Health Leptospirosis vaccines are equal to, if not the best in the world. For the prevention of leptospirosis in cattle, sheep and goats caused by Leptospira borgpetersenii serovar Hardjo and L.interrogans serovar Pomona and as an aid in the control of leptospirosis in deer caused by the named leptospires. For the prevention of urinary shedding of the named leptospires in cattle when used prior to natural challenge and to prevent the risk of human leptospiral infection associated with shedding of the named leptospires in the urine and from the reproductive tract of cattle. For the prevention of reproductive tract colonisation and placental and foetal infection with L. Hardjo. Leptoshield vaccine provides unique protection by preventing the shedding of leptospires (L.hardjobovis, L.Pomona) in urine and from the reproductive tract. This means that as well as the animal being protected from the productivity losses associated with Leptospirosis, the vaccine also prevents the animal from contaminating the environment and placing people and unvaccinated cattle at risk. Leptoshield can be used in calves from 6 weeks of age. This ensures early protection, preventing calves from becoming infected and shedding leptospires. Following the initial primary course, a single annual dose is all that is then required to provide on-going annual protection, without the need for six-monthly booster doses.